A murder has taken place. A woman is dead. We don’t know who killed her. And we don’t know who was watching. 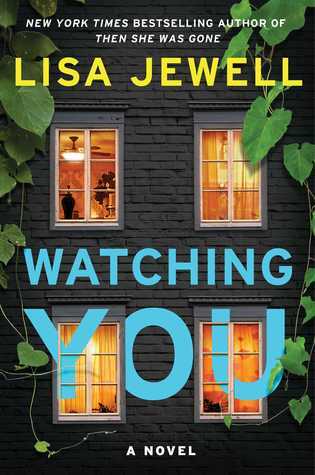 The stunning cover of Watching You gives the impression that it tells the story of someone watching others through the window, and that’s exactly what this book is about. Joey (Josephine) is a twenty-seven-year-old living with her boyfriend, brother, and brother’s wife in a charming Bristol suburb. Joey becomes infatuated with her neighbour, Tom, a fifty-one-year-old who lives with his wife, Nicola, and teenage son, Freddie. Freddie is socially-awkward, is on the Autism spectrum, and is obsessed with observing people in the neighbourhood. One of Tom’s students, Jenna, lives with her mentally-ill mother who is paranoid and captivated with watching everyone. Jenna is suspicious of Tom’s behaviour and thinks he has an inappropriate relationship with a student. If you don’t like unlikable characters, then this may not be a good choice for you. Watching You is an intense story with short chapters, and intriguing characters. I was trying to figure out the mystery the entire time, and was mind-blown when everything was revealed. The idea of characters being watched, or watching others gives this thriller a creepy feel. Highly recommend! Thank you to Netgalley and publisher for the complimentary copy in exchange for my honest review. “Lisa was born in London in 1968. Her mother was a secretary and her father was a textile agent and she was brought up in the northernmost reaches of London with her two younger sisters. She was educated at a Catholic girls’ Grammar school in Finchley. After leaving school at sixteen she spent two years at Barnet College doing an arts foundation course and then two years at Epsom School of Art & Design studying Fashion Illustration and Communication. She worked for the fashion chain Warehouse for three years as a PR assistant and then for Thomas Pink, the Jermyn Street shirt company for four years as a receptionist and PA. She started her first novel, Ralph’s Party, for a bet in 1996. She finished it in 1997 and it was published by Penguin books in May 1998. It went on to become the best-selling debut novel of that year. She has since written a further nine novels, as is currently at work on her eleventh. This sounds a bit darker than that one!